Aquaman Jason Momoa will be starring in a new Netflix series called Frontier, which will premiere on Jan. 20. The series will be a six-episode period drama that was co-created by Peter and Rob Blackie and directed by Brad Peyton. The Frontier show is based on wars around control of the fur trade in Canada during the 1700’s. If you’re not into history don’t dismiss the show right away. You might want to check it out to see Momoa on screen, who is known for his incredible physique. In fact, the Hawaiian native is no stranger to bulking up for his roles (think Conan the Barbarian, Game of Thrones and Stargate Atlantis). Here is a look into how he keeps his chiseled physique. Jason Momoa is no stranger to working out really hard. He’s bulked up for many of his roles, and although some of his favorite sports are surfing, skateboarding, and rock climbing, sometimes he has taken different routes to achieving his muscular frame. For instance, for his role in Conan the Barbarian, Momoa had to pack on a whopping 20 pounds in one and half months’ time. How did he do it? Well, the actor engaged in what’s known as the AR-7 workout. This helped with his weight gain as well as his muscle building goals. His trainer for the film, Eric Laciste, has said that this method was the key to Momoa’s workout for a variety of reasons. One of them can be found in the name itself—this method definitely speeds up the time it takes to see results. Momoa would do up to three workouts per day and did the seven, six, and five sets of each lift. By doing seven sets of seven reps, followed by a seven-second rest, and then repeating this but with the number six, and then five, the process of building muscle is sped up. Resting for one to two minutes is helpful before proceeding into the next round. This is not your typical weightlifting workout. It is unique in the sense that it uses the concept routine of heavy reps, insufficient rest, and low weight to create soreness and striving for more muscle building. 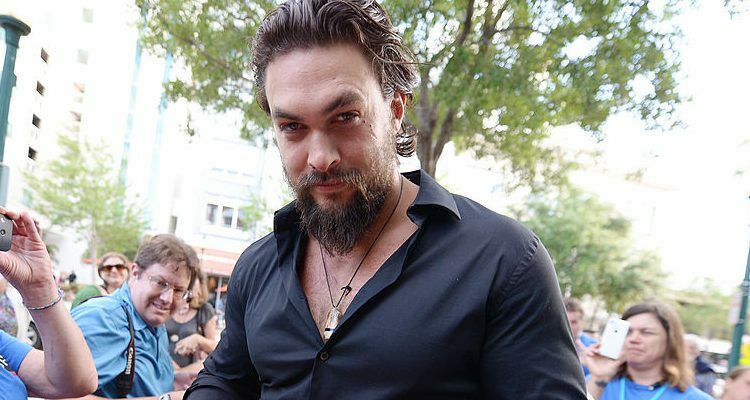 Jason Momoa’s diet consists of eating lots of high-protein foods like boiled chicken breast in combination with vegetables as a source of fiber. Momoa admits that he loves carbs, but training for roles kept him very disciplined in avoiding those types of foods. Sometimes he would eat peanut butter to give him some energy. Although his dieting in the past has been more extreme, Momoa maintains that achieving a fit body is really as easy as eating cleanly and exercising, so he tries to follow that regimen as much as possible. Petski, D., “Jason Momoa’s ‘Frontier’ Gets Netflix Premiere Date,” Deadline Hollywood web site, November 14, 2016; http://deadline.com/2016/11/jason-momoa-frontier-netflix-premiere-date-drama-series-1201854061/; last accessed November 16, 2016. Davis, C., “Jason Momoa Workout & Diet: A Leaner, Meaner Conan the Barbarian,” Pop Workouts web site, February 23, 2016; https://www.popworkouts.com/jason-momoa-workout-conan-barbarian/; last accessed November 16, 2016.